Elly Curshen, AKA Elly Pear, owner of the hugely popular Pear Cafe in Bristol has after a long period of posting tempting snippets across her Twitter and Instagram accounts has released a book. A very inviting, bountiful, beauty of a book. 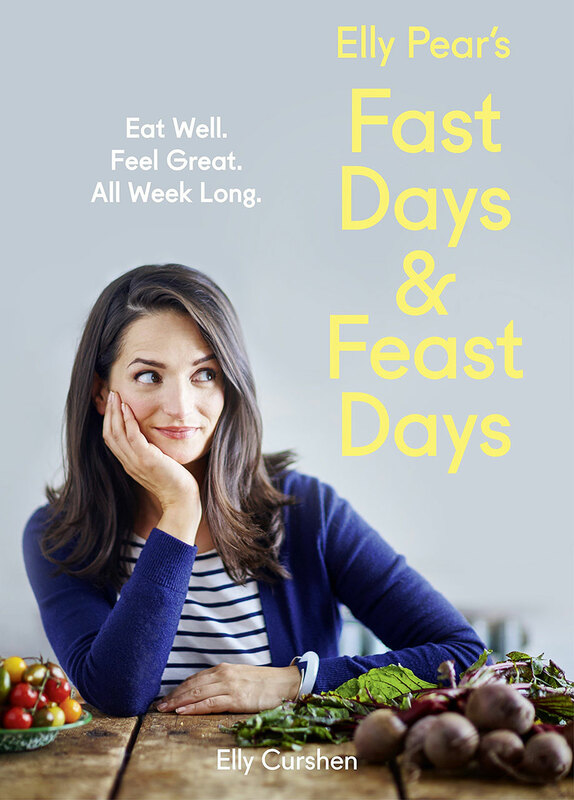 Elly Pear’s Fast Days & Feast Days is based on the 5:2 philosophy of eating and Elly shares some fresh ideas for great food. It is a book packed with over 120 recipes for both feast and fast days, including some recipes from the now famous Pear Cafe. Her cooking is inspired by world cuisine but admirably she is always keeping an eye on local, seasonal ingredients too. 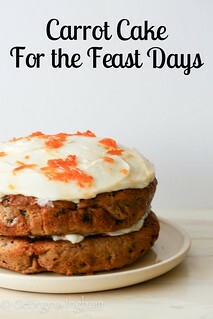 It is hardly surprising that I delved straight into the ‘feast’ day recipes. Sure, I’m not exactly known for going down the ‘health food’ route, although I promise I do try to keep a balanced diet. Honest. 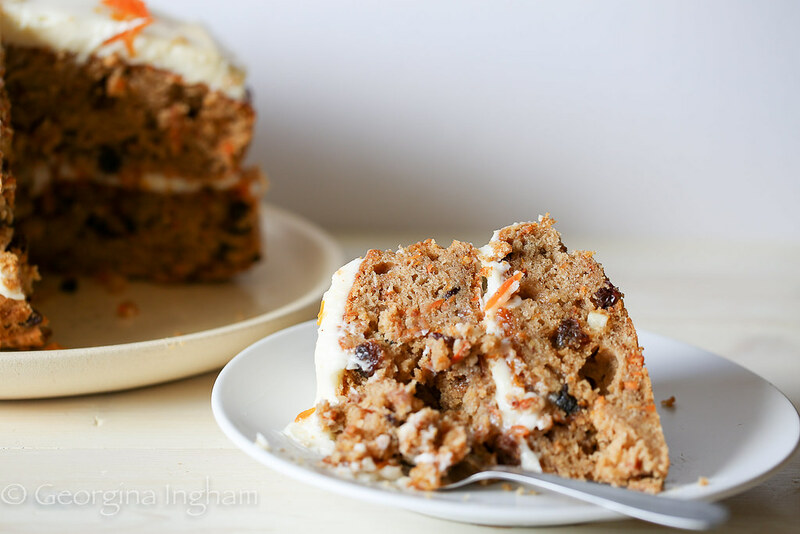 I’d say 90% of the recipes appeal to my style of eating, but, the Best Ever Carrot Cake just screamed “Make me! !” as soon as I saw it, and that is without an accompanying photo. The thing is, I just love carrot cake. It is not a fashionable cake, in fact is a lumpy, bumpy and slightly frumpy cake. But it is also an incredibly moist flecked light brown-hued spice cake with quite a history. 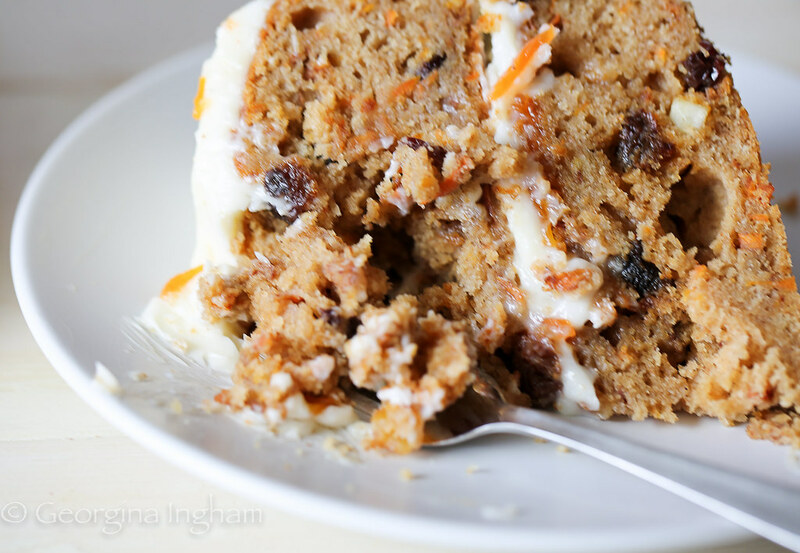 Believe it or not, the idea of using carrots in desserts actually dates back to Medieval times, when carrot pudding was enjoyed as a sweet at banquets. This was probably borne out of necessity, making use of the carrots’ natural sweetness (they’re the most sugar rich vegetable with the exception of sugar-beet); while the pudding would have been a steamed and a not very cakelike affair. There’s been much adaptation over the years though until we get to the modern day version, as much as you might like to think it, there was no fluffy frosting on the original version. The biggest development in the world of carrot cake came in the early twentieth century when the pudding began to be baked in loaf pans, in the style of a quick bread. Carrots were used as an agent of moisture and sweetness in cakes, when luxury foods were rationed during the first and second world wars. The UK government even distributed recipes during the second world war to promote the carrot as a nutrient-dense ingredient. By mid-century, the carrot cake had made its way over to America, where it would make dessert history. Most likely, the recipe was imported to America following the second world war, where it caught on in cafeterias and restaurants. However, there is a interesting story which indicates that following WWII there was a glut of canned carrots in the U.S; and an enterprising businessman named George C. Page hired bakers to find uses for the cans of carrots to create a demand for the product, and the solution was carrot cake. 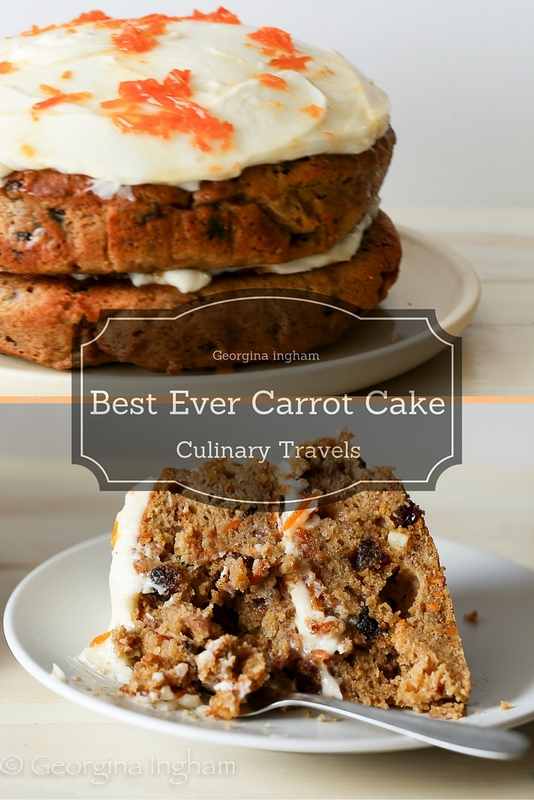 At first a novelty, carrot cake nonetheless proved popular enough to stick around on menus. It might not be considered the most fashionable of cakes but it sure has stood the test of time hasn’t it? And so I began. Without even checking my store-cupboards I began. Only to find as I was weighing out the ingredients that I had no walnuts. Several options were available - omit them, go shopping or replace them. Now everyone knows a carrot cake without the crunch of nuts just isn’t a real carrot cake don’t they? So omission was out of the question. The rain was pouring and I really didn’t want to brave the elements so to the shops I would not be going. Which left one option - subbing them with something else and that is what I did. I swapped the walnuts for pistachios, took the Middle Eastern theme and ran with it using some Iranian carrot jam from Persepolis to sandwich the cake halves together too. Elly’s recipe uses a traditional cream cheese frosting, but you’ve guessed it, I didn’t have cream cheese, only mascarpone which is of course very similar. Instead of beating the mascarpone with butter I just whipped it with a small (relatively speaking) amount of golden icing sugar until light and fluffy and used that instead. This slather of cream cheese, butter, icing sugar became the frosting of choice in the 1960s, a time during which Philadelphia Cream Cheese released many recipe pamphlets; including one for carrot cake and cream cheese frosting which is where they really became a truly bonded pair. 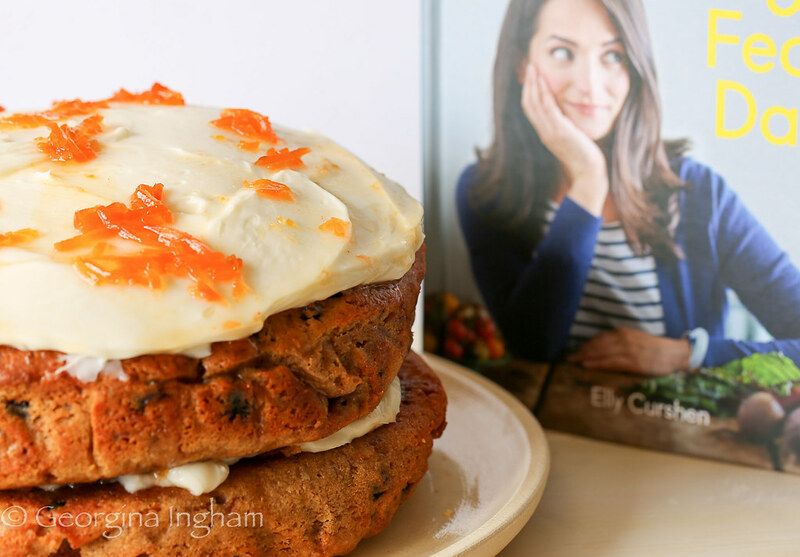 Elly’s Best Ever Carrot Cake is huge, with at least 12 massive, finger lickingly good slices. No bad thing as it keeps well for a few days but, be warned it is addictive and saying no to second portions is a very difficult thing indeed. It keeps well because it is so moist. Unlike a sponge cake, carrot cakes are made using a method similar to that of muffins. That is they use a method where you fold the dry ingredients very gently into wet ones - there’s no creaming going on here. This has another advantage too, they’re ultra quick to throw together. In fact, there’s no reason why you couldn’t make this cake into muffins and drizzle with a little citrusy or rose water flavoured condensed milk icing for a delightful packed lunch box treat. And what with all the dried fruit, nuts and carrots they’d have to be considered somewhat healthy wouldn’t they? 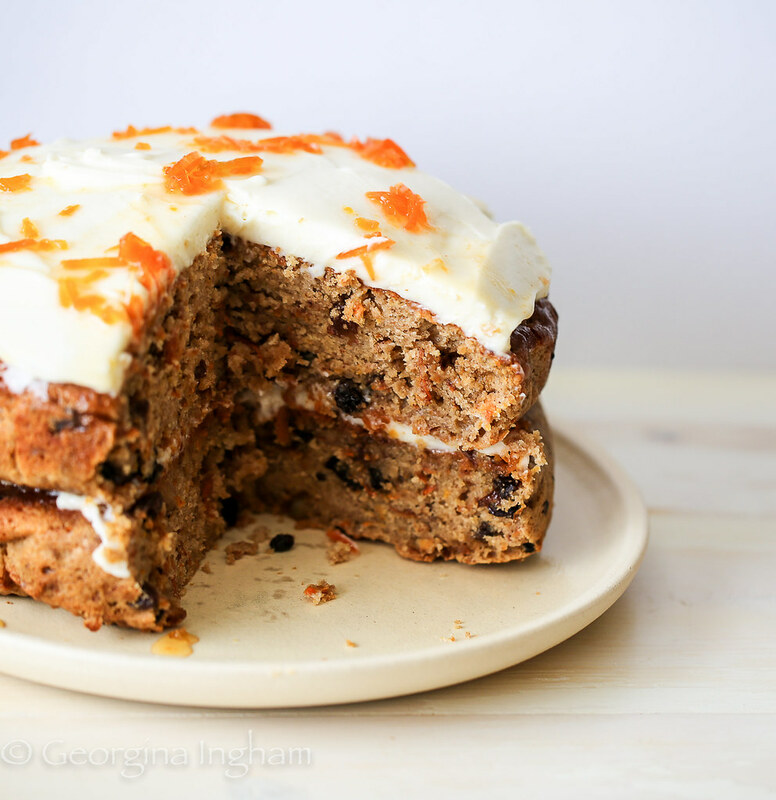 Unlike sponge cakes this carrot cake keeps extraordinarily well because it is so moist. I have given Elly's cake a Middle Eastern twist swapping the more traditional walnuts for pistachios and spreading a little Iranian carrot jam between the layers. If you wanted to take the theme one step further you could even swap the vanilla extract for rose or orange blossom water. 2. Grease and line a 25cm spring form round cake tin with baking parchment. 3. Sift the flours and spices into a large bowl and stir in the sugars, carrot, sultanas and pistachios. 4. In a separate bowl whisk together the oil, eggs, yogurt and vanilla extract. 5. Add the wet ingredients to the dry ingredients and stir gently to just combine. Be careful not to overwork the mixture as it can make the cake heavy and dense. 6. Pour the mixture into the tin and smooth over the top. 7. Bake in the centre of the oven for 2 hours, or until a cake tester inserted into the centre of the cake comes out clean. 8. Remove the cake from the oven and leave to cool in the tin on a wire rack for 15 minutes before turning out and allowing to cool completely. 9. When the cake is cool, make the icing by whisking the mascarpone and icing sugar together until smooth and fully combined. 10. Use a bread knife to carefully split the cake in half. 11. Spread the carrot jam over the bottom half of the cake and then spread a third of the mascarpone frosting over this. 12. Sandwich the cake halves together and ice the top of the cake with the remaining frosting, leaving the sides naked. Drizzle with a little extra carrot jam if wished.